My name is Adam Michael and if you are subscribed to my newsletters you will know I adore all the various Frankincense species in oil form. I have now teamed up with a Co-Operative in Somalia and I am buying the Frankincense Carteri (Boswelia.carteri) and Frankincense Sacra (Boswelia.sacra) essential oils they are responsible for producing. We are selling these oils in 5ml volumes upto 30ml volumes. I have decided to do a little write up about it and hope you find it useful. Somaliland Co-Operative Project is aimed at making sure more money feeds into the hands of those involved in harvesting, cleaning and distilling Frankincense oil. There are 43 families involved in this co-operative which spreads across the Sannag region. Between them approx. 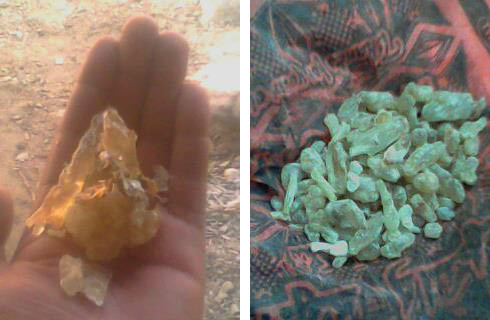 55% of Somaliland frankincense and 65% of the myrrh grows on their land. 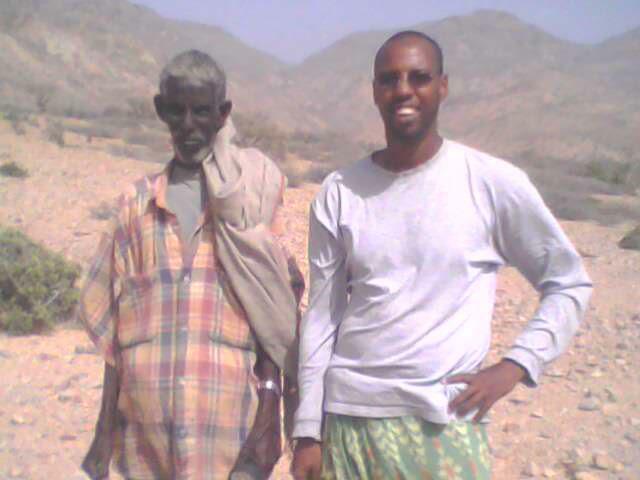 The photo above is of my supplier (right) with his cousin on their way to Ciilaamo – a village synonymous with Frankincense in the whole of East Africa. Market traders in the Merkado incense market in Addis Ababa, (Ethiopia) sell to many Saudi merchants who specifically want Frankincense from this area as it’s regarded as the best of the best and the only Frankincense good enough for the world’s Coptic population. The main problem is not receiving a fair price due cartel like control certain wealthy individuals have on the domestic stage in Somaliland. With no visitors to the land that yields these gums and traders and co-operations not passing the main towns buyers tend to confine themselves in the big cities of Hargaisa 1000km to the west and Buroa 500km west of these regions. The national scene has been manipulated making land owners families compete with each other and thus pushing prices lower. So by buying from Hermitage Oils you not only get a product of excellence but you also see more of the money that changes hands goes to the people of Somaliland and at the same time you also get a better price as less middle people are involved. On the subject of Frankincense Sacra I want to state that regardless what anyone claims Sacra is not a unique plant species and should not really be sold as such. It is a truth which seems to be very well covered up, especially by various American resellers selling Boswellia sacra as Sacred or Holy Frankincense. The fact is no morphological differences exist between Boswelia carteri and Boswelia sacra, they are from the same species. What actually separates these two supposed species apart from each other is nothing more than habitat and time of harvest. Boswelia carteri is harvested in the summer months of March to late June (xagaag), Boswelia sacra in the winter months of September to late November (jiilaal). Both my Somaliland carteri and sacra are harvested from trees grown in rocks and on cliff faces. The trees are left alone for a good eight to ten years before they start producing resin and are as organic as it gets. In some cases trees are left alone for a good 30 years and inherited by the future generation. Chemically speaking the components of the two supposed species harvested are identical but due to weather conditions trees are exposed to which can vary from extreme heat to extreme winds and rain storms combined with the positioning the tree grows the percentages of the natural chemistry varies and subsequently differences are present in the fragrance and also in the colour of the resins. Generally winter harvests produce a dark resin (mohor madow sacra) and summer harvests a white coloured resin (mohor ade – ade means white). For me I would say sacra possesses a finer and more penetrative fresh lemon quality compared to carteri. Both oils contain high percentages of the prized octanol, incensol, and octyl acetate. My Uncle’s supplier in Somaliland sums it up perfectly – ‘god made people into different colours and put them into different places and yet they are exactly the same and it’s the same with tree’. The resin flows from the tree when a tool called a ‘mengaff’ (very sharp at one end and blunt at the other end) is used to scrape about a five-inch section down the trunk of the tree. This hardens under the hot sun into amber or orange brown ‘tears’ between the sizes of a pea and an orange. The tree is marked and the harvester returns inside a fortnight to scrape the hardened resin from the tree. Resins which fall to the ground are collected on large palm leaves placed when first tapping the tree. The process repeats itself for about 3 months during harvesting. The frankincense tears are scraped off into a basket and transported by camel to the ports for world-wide shipment. Camels are still used for the logistics. 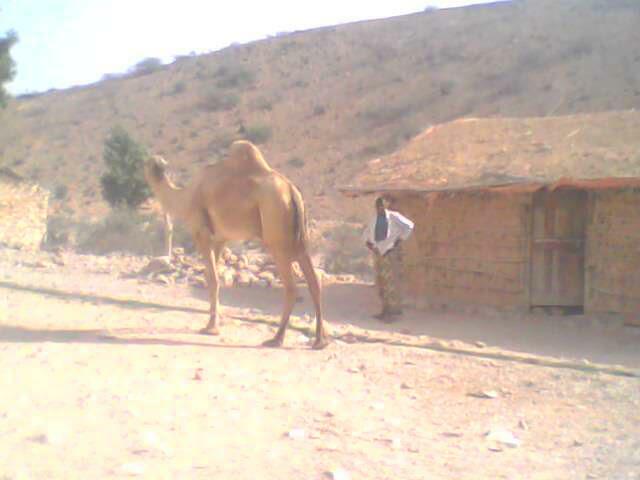 The photo with the camel is my supplier’s nephew bringing his camels to the watering hole after a midnight trek. The gums cannot be transported during the day due to heat and humidity which ruins the gums and pushes prices down. So the most utter care is taken to ensure the gums are sent to the middlemen in the best conditions, and camels are the best options available. The same watering holes are also used for human consumption. No aromatic commodity has a more interesting history than Frankincense. The first ever Christmas Story suggests upon the birth of baby Jesus he was visited by three wise men who each gave him a gift of great meaning, as we all know the gifts where Frankincense, Myrrh and Gold. Personally what fascinates me the most is as early as the seventh century (I think!) Frankincense was one of the most valuable and heavily traded commodities along the Silk Roads. The Silk Roads where a network of connected trade routes that spanned from Europe all the way to the Asian and African continents. Simply put this was World trade in earliest format and Frankincense is said to have had higher value than rare silks, human beings and Gold. The name Frankincense is derived from the Old French meaning ‘real incense’. ‘Olibanum’ another name for Frankincense is a corruption through the classical languages of the Arabic luban, which strictly means ‘gum’ but, in practice, is always applied to this commodity. And that is it, so if you use Frankincense carteri or sacra please do consider Hermitage Oils.